Prominent & Leading Wholesale Trader from Pune, we offer bottom loading dispensor. We are one of the leading wholesaler trader and suppliers of Bottom Loading Dispenser. Blue Star: One of the Largest Air conditioning Company in India offering Bottled Water Dispenser and other HVAC products. 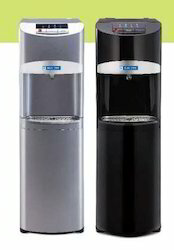 Say goodbye to lifting cumbersome and heavy water bottles every time you refill your water dispenser. The new Blue Star Bottom-loading Water Dispensers come with a feature of convenient loading so that you can slide in the bottle instead of lifting it. Apart from being convenient, they are also stylish and space-saving. Available in three attractive colors, Blue Star Bottom-loading Water Dispensers are a perfect match for your home. Looking for Bottom Loading Dispensor ?